Lloyd Nolan’s Mike Shayne differs from the detective featured in the novels, but he’s one of the best things about the film. Welcome back to Forgotten Films. This week I decided to go a little further back and pick a B movie that many people have not seen. 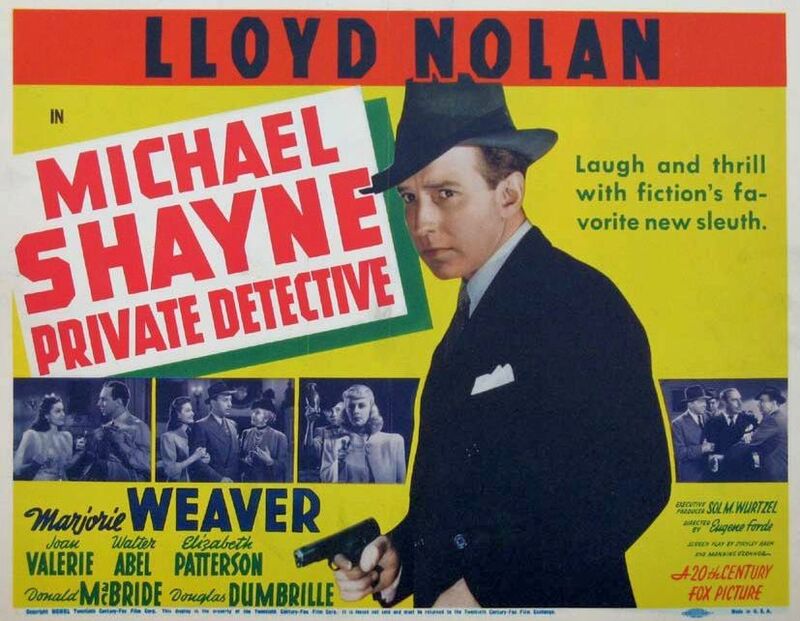 Michael Shayne, Private Detective was the first of the Mike Shayne stories to go onto celluloid and it has both good and bad points. The first good point is Lloyd Nolan who played Shayne in seven films for Twentieth Century Fox. He makes an interesting Shayne, tough and no nonsense but one who has a whimsical side too. The film begins at the race track where Phyllis Brighton (Marjorie Weaver) is losing badly. Her father Hiram Brighton (Clarence Kolb) refuses to give her money to place a bet on a 15-1 long shot. She finds a bookie and attempts to pawn off an expensive brooch to cover a $200 bet. Shayne is nearby and spoils her deal by telling the bookie the jewelry is paste. Phyllis does not know Shayne, but Shayne knows her and her father. Imagine her rage when the horse wins unexpectedly and she does not get her $3,000 reward. Phyllis complains to her father about Shayne and dear old dad decides that Mike is exactly the person he needs to keep his wayward daughter on the straight and narrow. Since times are a little tight (the furniture company is repossessing his office when Brighton calls), Mike takes the job. The first stop is a local casino where Phyllis is hanging with Harry Grange (George Meeker), the guy who had given her the tip on the horserace. She is playing roulette and not having any luck. She hits Grange up for a loan and as he is giving it to her, Shayne interrupts. There is discussion and Phyllis takes the money anyway. Shayne goes to talk to the owner Gordon (Douglas Dumbrille), who is arguing with his daughter Marsha (Joan Valerie) about Grange. Shayne convinces Gordon to give Phyllis back the money she lost. There is a conference with Grange, Phyllis, Gordon and Shayne. It ends with Shayne punching out Grange and taking Phyllis to her home. Here he meets Aunt Olivia (Elizabeth Patterson) who has always wanted to meet a real detective. She loves solving murder mysteries and regales Shayne with the stories of those she loved. Phyllis has been locked in her room, but she has a spare key and promptly returns to the casino and Grange. Shayne, of course, follows but lets her alone. Instead, he drugs Grange and takes him away in Phyllis’ car, where he applies catsup to the front of his shirt. He then goes back to the casino and picks up Phyllis and is driving her home since she cannot find her car. He also calls his comic foil Chief Painter (Douglas McBride) of the homicide division to put the fear of god in her. Driving her home, they spot Phyllis’ car and the slumped form of Grange. Phyllis recognizes the catsup and tries to shake Grange awake. That’s when she sees the gunshot to his forehead. They also find Mike’s gun nearby. It’s been fired. Mike sends Phyllis home and throws the gun away and awaits the arrival of the police. Things get tough when the police (tipped off by Gordon) find out about the altercation between Grange and Mike. The film swings between comedic spots and a real mystery. Shayne wisecracks through the whole film. Soon there is murder, kidnapping, horse race fixing and other drama to keep the story moving. Aunt Olivia steals the show whenever she is on stage. And Phyllis begins to think that having Shayne around might not be too bad. As I said, Nolan is a good thing about the film. But he’s also a bad thing. He is not really the Mike Shayne form the novels (though by the time the film came out, only two had been published). The Shayne of the novels was Irish, red headed and married. Nolan’s not any of these. But, that said, I liked him. Nolan delivers up something that is a combination of the hardboiled Shayne and the comedic Thin Man type. It must have succeeded because Fox did six more films with Nolan and then the series shifted to PRC where Hugh Beaumont (of Leave it to Beaver fame) did five more. Shayne also went on to appear on radio in several series and on TV. Brett Halliday (a pseudonym used by Davis Dresser) wrote at least 50 Mike Shayne novels (and others wrote 27 more as Halliday, bringing the total to 77). Some of my favorites were written by Robert Terrell, who also did some nice hardboiled work under his own name and Robert Kyle. Overall I like the film. You should check it out. This first one is available on YouTube or in the Michael Shayne Mysteries collection, which has the first four Nolan Shayne offerings. As always, my taste is in my mouth. You may hate these things. Hope not, but it’s your life. I will probably miss the next couple of weeks as I am in the process of moving and it looks like it will be happening imminently. If I do miss my movie reviews, check out Todd Mason’s blog and see what some of the other folks who do the Forgotten Films have to offer up.